"This box is AWESOME! Exactly what I was looking for and then some. Thanks for coming up with something like this. Feel free to use me as a reference if anyone wants to know how well it works!" "I really am so happy with this new box that I just wanted to write and say thanks for dreaming this up in the first place and for delivering what is a top quality product that does everything you say it does and does it perfectly at a very reasonable price. It’s not all that common in the gear gadget world anymore and I appreciate it!" 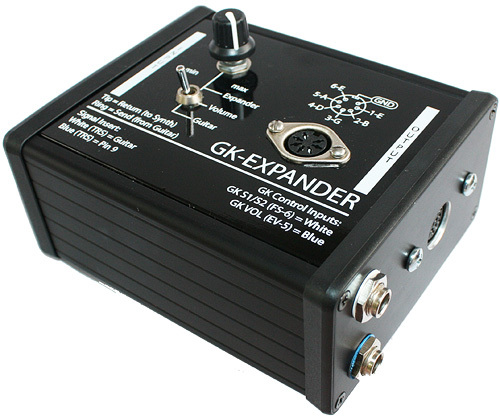 I designed the GK Expander after receiving some requests from Roland guitar synth users who wanted to use the amp modeling and effects in the Roland GR-55 with guitars that do not have a GK-3 pickup attached. It was clear the simple solution, attaching a 1/4" guitar jack to pin 7 (guitar signal) would not work. The impedance mismatch sucked all the tone out of the guitar signals. It sounded horrible. To use any guitar with the Roland GR-55, it would be necessary to create a stand-alone circuit that worked exactly like the buffer circuit the GR-55 was designed for. After some consideration, I realized that more than just a buffered input is necessary, as the player would also want a way to control the volume of the GR-55, and perhaps change patches as well. 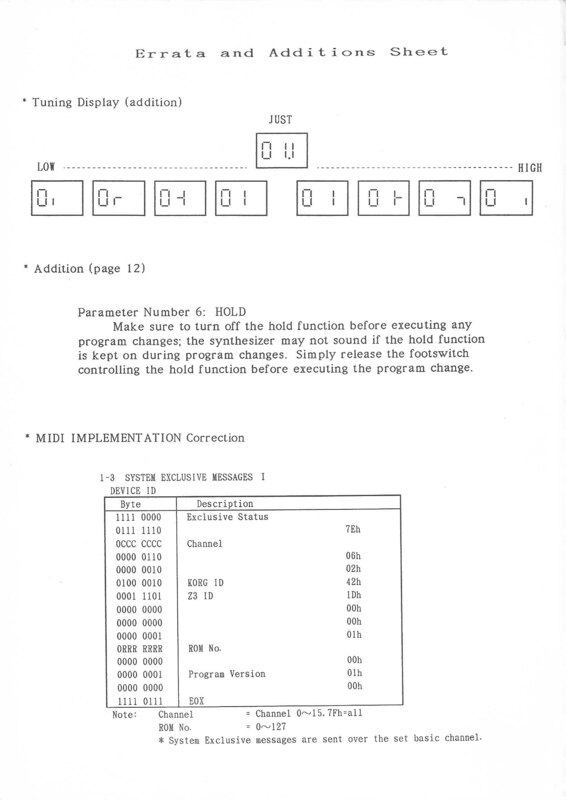 In short, to complete the system it would necessary to recreate the basic 13-pin control signals. 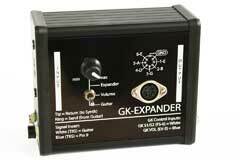 So the GK-Expander has its own volume control circuit, plus inputs for an optional Roland FS-6 foot switch (or similar) to send GK S1/S2 switch commands. Even if all your guitars have 13-pin pickups attached, the GK-Expander is still valuable: not only can you plug a Roland FS-6 to enable hands-free GK S1/S2 commands, you can also plug a Roland EV-5 into both the GK-Expander Guitar and GK VOL volume jacks to independently control guitar and synth volume without taking your hands off the guitar. And since this unit is designed for the more adventurous guitar synth player, I included a 7-pin DIN jack to provide access to the individual guitar synth string outputs. These connections work both ways. 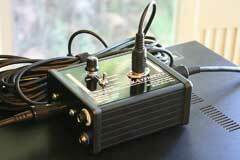 With a guitar attached, you can use the 7-pin DIN interface jack to send individual signals to your computer. These can also be used as inputs: you can take six individual outputs from your computer interface and send recorded synth guitar signals back through the GK-Expander to a Roland guitar synthesizer. Be sure to unplug your guitar if you do this! The attached synth should not be receiving signals from both the computer, and guitar. This could damage the outputs in your GK equipped guitar. By using a computer you can really expand the power of your existing GK/GR rig. The GK-Expander does not replace a Roland GK-2/GK-3 divided hex pickup if you want synthesizer effects! But it does allow non-GK equipped guitars to use the GR-55 in the same way a standard guitar can use the Roland GT-10. 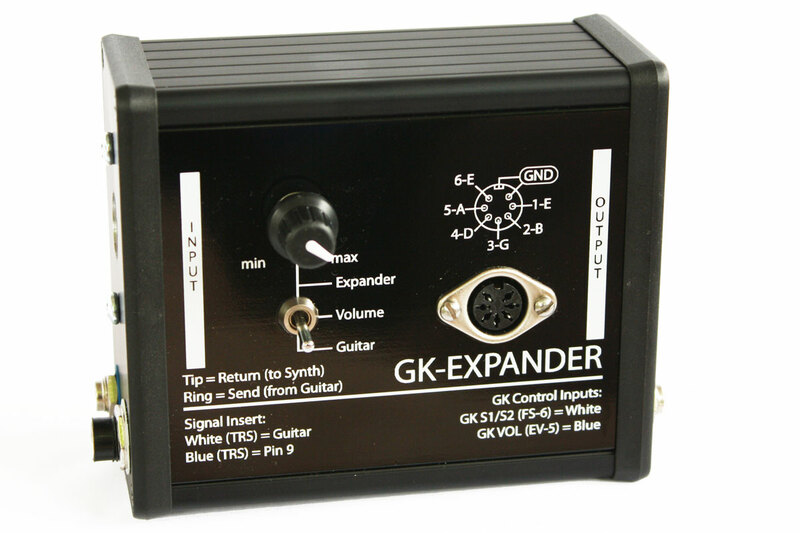 And the GK-Expander expands options for GK equipped guitars, with individual outputs, control options, etc. Native Instruments Reaktor User Library. Search for "GSynth2.ens". 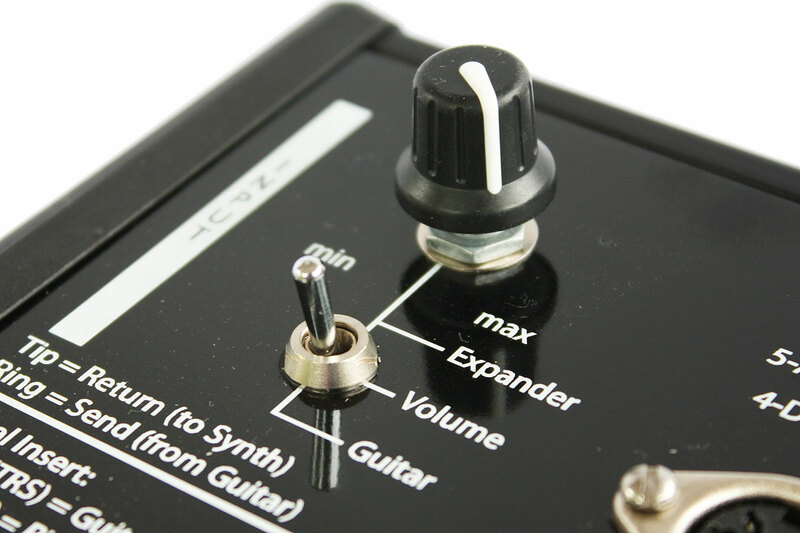 By plugging a Roland FS-6 foot switch into the GK-Expander by using a tip-ring-sleeve cable, you can switch GK S1/S2 settings without using the switch on the guitar. Any switch will work, but I like the FS-6 for its versatility, since it can be used in latching or non-latching mode, and configured as normally open, or closed. You can also control the GK Synth Volume with a Roland EV-5 pedal. The GK guitar volume sets the maximum volume, so if the guitar volume knob is at 50%, pressing the EV-5 pedal to maximum still results in 50% volume. Or, you can use the top panel switch to to select “Expander,” and the volume knob on the GK-Expander sets the maximum volume. And again, an optional EV-5 can be used to further control the volume. 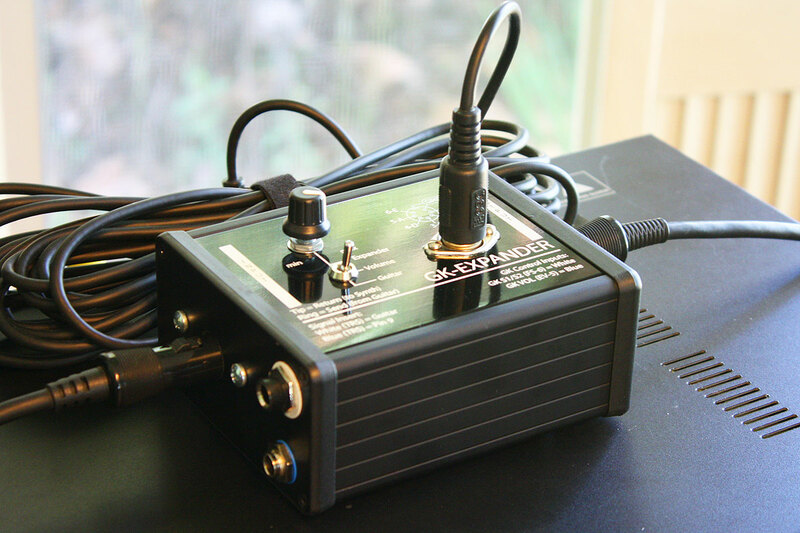 The GK-Expander has a buffered guitar input circuit, designed to match the impedance of the buffer circuit in the Roland GK-2/GK-3. 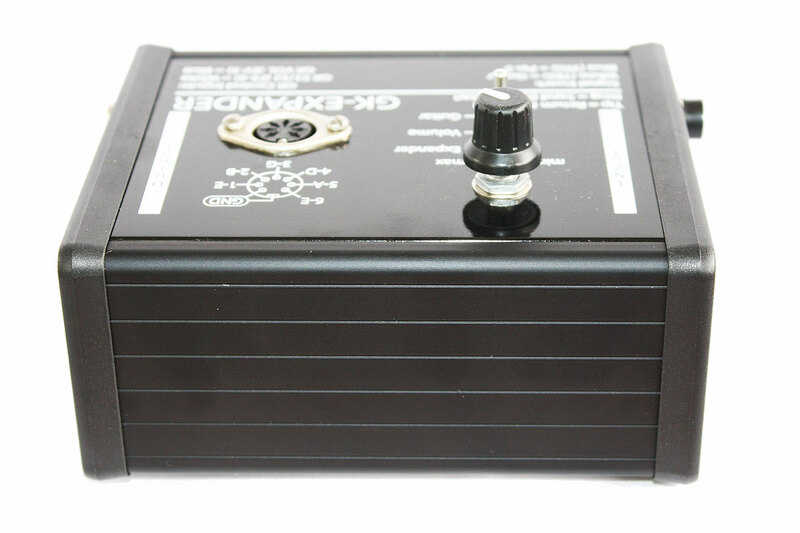 A special input jack is used for the guitar, it has an electronically isolated double-pole-double through switch to maintain the integrity of the guitar signal path. If you are familiar with foot pedals, this is the same thing as having a true-bypass switch controller by the mechanical insertion of the guitar cable. This is important: when GR users realized the GR-55 did not have a standard guitar input, like the Roland VG-99 does, the easy solution was to cut open a 13-pin cable, and just wire a 1/4” guitar jack to pin 7, the guitar signal. However, because of the impedance mismatch, this sucked all the tone out of the guitar output. It sounded terrible. The GK-Expander solves this problem with no loss of the guitar tone. The GK-Expander buffered input can also serve as an effects loop, enabling external effects to be used with the Roland GR-55 or VG-99. A tip-ring-sleeve (TRS) cable will be used to add an external effect. The "ring" connection should be plugged into the effect input, and the "tip" connection is plugged into the effect output. Check out this YouTube clip using a Korg ZX1G with the GK-Expander in an effect loop. 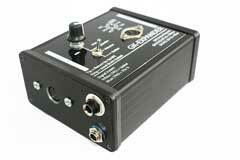 Special Note on Impedance: Some effect pedals, such as wah-wah pedals, are more critically effected by input impedance. The best way to use this pedal with the GK-Expander is to plug your guitar directly into the effect pedal, then take the output of the effect into the buffered input of the GK-Expander. 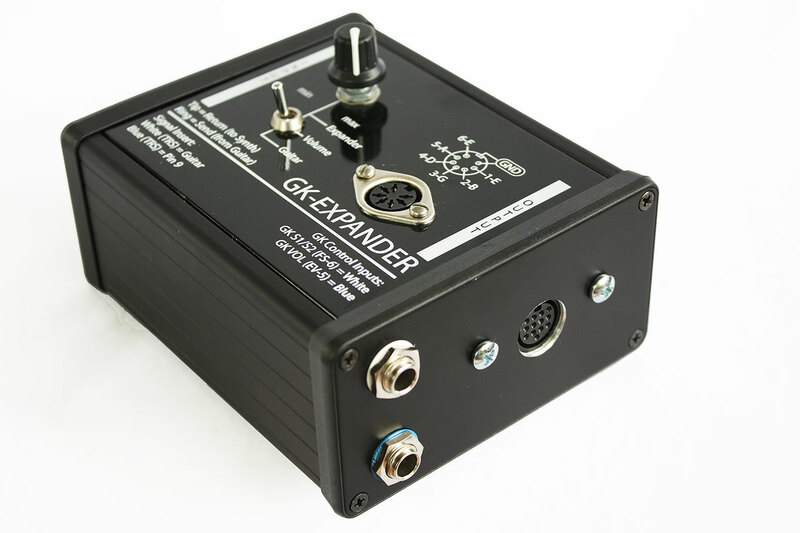 Finally, the GK-Expander has a 7-pin din connection to allow direct access to the individual GK string signals. This means you can record the individual signals direct to your digital audio workstation, process them, quantize them, and then play them back through your Roland synth. In the video example, I connected the six outputs directly to six inputs on a MOTU 2408 MK3 interface. I played a simple pattern into Digital Performer. Then I unplugged the guitar from the GK Expander, and moved the patch cables from the MOTU inputs to the outputs. I unplugged the guitar so that the VG-99 would not be receiving input signals from both the guitar, and the computer. VG-99 plays just as if I am playing the guitar parts. Then I connected the GR-55, to hear the same pattern with the GR-55. 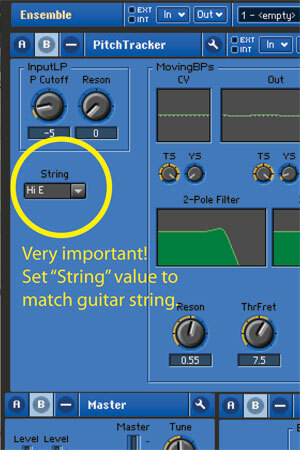 With the individual guitar tracks in the computer, parts can be quantized, repeated, or guitar synth sounds can be layered. And you can do more: With the individual outputs from the GK Expander connected to the 2408, I opened up six auxiliary tracks, and I inserted a basic Reaktor guitar synthesizer patch designed by Mark Smart. This enabled me to do real-time, low-latency guitar synthesizer using my computer. Since I was using a different plug-in on each string, I was also able to set the synth parameters differently for each string. Some strings have a long attack, some were percussive, and some were layered in 5ths. This opens up whole new horizons for guitar synth players, you are no longer restricted to the limits of hardware guitar synths, you can now access the huge range of plug-in audio synthesis. Will the GK-Expander work with...(insert name of guitar of synth)? I have tested the GK-Expander with the Roland GR-55 and VG-99 synthesizer. I used a GK-3 pickup. It should work with any Roland guitar synthesizer, or pickup system, but I have only tested it with the GR-55, VG-99 and the GK-3. I used the HOSA/Rocktron 7-pin cable to connect to my breakout box. Hosa MID-725 (25' 7-pin MIDI Cable). You can find these cables on eBay for around $15.00. 1) The GSynth2 is monophonic: The GSynth2 ensemble works for one string only, so you will need to open six instances of Gsynth2 to create apolyphonic guitar synthesizer. Scroll down and you will find “Guitar Synthesizer”. Since the GSynth2 is monophonic, you need to open six instances to create a polyphonic guitar synthesizer. You can do this in the Reaktor environment, or you can open multi instances in DAW software. On the software side, I open six instrument tracks in Digital Performer and insert the Reaktor plug-in on each track. 4) How to set up your hardware: On the hardware side, I use a MOTU 2408 interface, and take six outputs from the GK-Expander, and plug into the first six inputs of the 2408. 5) String Settings (Very Important! ): You need to select the string type for each instance! One of the reasons that the GR-300 works so incredibly well is that each string has a specific input filter to maximize the operation of that string within a limited frequency range. In the original GR-300, this is set by the value of a capacitor in the initial input. Learn more about the GR-300 tracking system. On the GSynth2, there is a tiny toggle in the upper left hand corner. You can set each instance for “A” or “D” etc. You need to set this correctly! If not, you will get very poor results, or it will not work at all. The GSynth2 ensemble has a lot of cool graphics, mostly related to the operation of the pitch-tracking system. 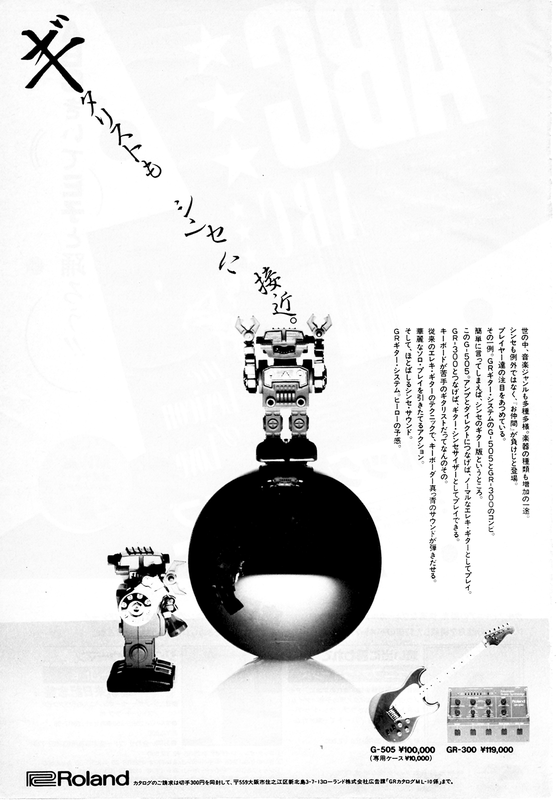 You will notice in the upper left hand side, the movement of the “adaptive filter” copied from the GR-300. This is a filter that changes value when you play on or around the 5th to 7th fret. This aids in keep the tracking accurate across the range of the neck. The GR-55 has many options for controls signals, outputs, and effects assignments. You can have your rig setup up perfectly, yet not get the desired results, or even be certain that everything is working, given the complexity! One sure fire way to trouble shoot a complex, programmable synth like the GR-55 is to start with a factory patch. Guitar Mode: LEAD BANK (1), Patches 30-1 "for NORMAL PU 1", 30-2 "for NORMAL PU 2", or 30-3 "for NORMAL PU 3." Bass Mode: LEAD BANK (1), Patches 10-1 "for NORMAL PU 1", 10-2 "for NORMAL PU 2", or 10-3 "for NORMAL PU 3." If you call up either (guitar) 30-1, or (bass) 10-1, you will hear a synth organ sound layered with the sound from your normal guitar pickup. Confirm that this is the case, and familiarize yourself with the sound of your conventional guitar/bass pickup signal passing through the GR-55. Now try plugging another guitar (or bass) into the large, WHITE special input jack on the GK-Expander, on the left-hand side of the GK-Expander (input side). When you plug into this jack, the original direct sound from your conventional guitar/bass pickups should stop sounding, and you should be able to hear the sound of the instrument you just plugged in instead. This is a great way to test the functionality of the buffered input on the GK-Expander. I do this test before I ship each unit, and this is the same patch I use in the demo video, at 3:21. Now, you can try a TRS, tip-ring-sleeve, cable in the GK-Expander. If you have a Roland EV-5, you can verify the functionality of the GK-Expander guitar TRS input/insert feature by simply plugging the EV-5 into the WHITE input jack. Once, you do this, the EV-5 will control the volume of the conventional guitar/bass pickup (connected too your guitar's GK pickup) signal passing through the GR-55. If you are using an effect pedal as an insert, the "tip" should be connected to the output of your effect pedal, and the "ring" output should be connected to the input of the pedal. As a quick test of the TRS insert feature, try plugging the TRS cable in to the GK-Expander, but do not connect anything to it yet. By touching your finger to the "tip" output of the insert cable, you should hear the familiar hum you get when touch your finger to a live guitar cable. Similarly, you can touch the "tip" output to the "ring" output, and you should be able to hear the signal from your guitar, with perhaps some hum, since the connection made holding two cables together may not be properly grounded. This simple steps will familiarize you with the basic setup of using the guitar input, and the TRS effect insert feature, of the GK-Expander.